Tidbits has published an article on problems editing PDF files with Apple's Preview by its publisher, Adam Engst, who has watched the problems with Apple's Preview for some time now. 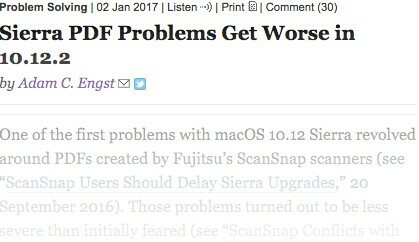 He's spoken to many other developers in the space and has arrived at some unfortunate conclusions, which spurred him to write "Sierra PDF Problems Get Worse in 10.12.2". The article has subsequently been taken-up by MacRumors, 9 to 5 Mac, AppleInsider and many other publications. Apple's less-than-complete attention to the published PDF specification and cavalier attitude to the integrity of users' files has been noted previously in many places, but Engst's broadside, especially as an expert in Apple's Preview, is new. It pains me to say this, speaking as the co-author of “Take Control of Preview,” but I have to recommend that Sierra users avoid using Preview to edit PDF documents until Apple fixes these bugs. Read Engst's article on tidbits.com.